Enjoy Avocado Spread 3 Ways for parties, snacks, and utilizing leftover. I don't know about you guys but I am mentally checked out of 2017. I will be traveling all through next week but I will be active on instagram . I am a big advocate of enjoying holiday season to the fullest - be it with your large family, solo staycation, get together with your friends, or whatever your idea of resting and rejuvenating is. It's okay if your shopping isn't done or you couldn't get holiday cards on time, or completely forgot you RSVP'd to your neighbor's holiday party. Be kind to yourself, practice self-care, and make life easy when possible. Today I am partnering with WHOLLY® SIMPLY AVOCADO™ to bring "Avocado Spread 3 Ways" so you have one less thing to worry about this holiday season for your snacking needs, for hosting, and utilizing leftover avocado spread. Making avocado spread or dip isn't rocket science but I am all for convenience especially when you can find a great substitute for fresh avocado that makes a great spread with minimal flavor enhancing ingredients. Now you can utilize SIMPLY AVOCADO™ (sea salt & garlic herb flavors) - 3 ways for get togethers, snacking, and utilizing leftover avocado spread. 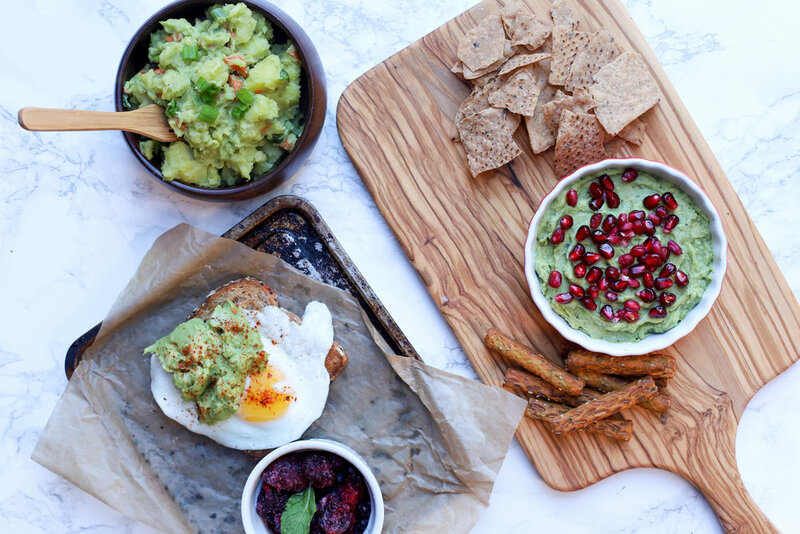 Give avocado spread a Holiday Makeover : Transfer SIMPLY AVOCADO™ Sea Salt into a nice bowl, top it with pomegranate arils, and serve with chips! This is a good recipe for parties & for last minute office potluck you almost forgot about. You can also enjoy it with crackers for mid-day snacking! Put an Egg On It : Avocado toast is all the rage and I am 100% behind that. Make yourself a quick toast + egg and add a scoop (or three, who is really counting) of SIMPLY AVOCADO™ garlic herb for a wholesome breakfast or quick lunch. I see myself adding SIMPLY AVOCADO™ to my breakfast tacos. Utilize Leftover SIMPLY AVOCADO™ in Salad : I hardly ever have leftover avocado spread but when I do, I utilize it in salads such as chicken avocado salad // smashed chickpea & avocado // potato salad. SIMPLY AVOCADO™ can be used as a replacement for mayo or you can swap 1/2 mayo for SIMPLY AVOCADO™. I hope you will pick up few SIMPLY AVOCADO™ at your local Walmart. It is conveniently located in the cooler by the deli area. I can't wait to see what you guys will create with SIMPLY AVOCADO™this holiday season. Make sure to share your creation using @foodpleasurehealth and don't forget to pin Avocado Spread 3 Ways for later use. Have you tried SIMPLY AVOCADO™yet? What are some of your fav ways to enjoy avocado? Leave me your answer in the comment below.